In December, we did home visits with the Yemeni refugees. This is the story of one of the families we have visited. *Najam is a lady from Yemen and she is married with five children. Her oldest daughter, Faiza, used to go to Doctrine College for her first year. When they were in Yemen, they went through a lot after the war started. Once, when Faiza was in school, they were air-bombed and a lot of students died but, luckily, she was able to run away. The second time, when they were bombed beside their home, the top floor of the building was destroyed, and they all started running for their lives and the family was scattered. Faiza took her two siblings and ran for safety, her mom took the other children and ran while her dad ran out alone. It has been two years since the incident and still there is no information as to where her father is. After a while, they decided to leave their homeland and head to Jordan but since they didn’t have enough money for the airplane tickets, they had to separate and come in small groups. Their aunt came to Jordan first, followed by Najam and then Faiza with her siblings. All 12 of the family members are living in one apartment, which has one living room and one bedroom. They can’t find any jobs except for the aunt. She works as a maid in several houses and feeds everyone and pays the rent and the bills. Faiza is hoping to continue her education and two of her sisters are going to school in Jordan. They all want peace to come upon their country. They were so happy and thankful for our visit. We encouraged the family and gave some toys to the children, which made them so happy. We also gave them blankets to stay warm in the cold season, food boxes, and some clothes, since they didn’t have decent clothes for winter. Dr. Rasha walked up to the line of refugee women and children waiting outside of GHNI’s Mobile Medical Clinic on a quiet and early December morning. The women and their children had arrived only a few minutes before on a yellow school bus and sat in a queue on the stairs of a community center, chatting with one another and watching as their children played. Dr. Rasha greeted them warmly and stepped through the door of the clinic to prepare for the day. In just two and a half hours, GHNI’s Mobile Clinic was able to serve 12 refugee women and their children. It served 82 patients during the month. The length of time the women and their children had been in Jordan varied from two months to two years, and those families served either came from Yemen or from Sudan. Many of the children were experiencing flu-like symptoms, and Dr. Rasha was able to provide them with medicine and care for their symptoms. Many of the women who had come into the clinic had various medical issues, ranging from rashes to infections, and Dr. Rasha provided care, treatment, and further direction for all of them. One of the women, *Manar, was the first off of the bus, but the last to be seen by Dr Rasha. After arriving at the clinic, she immediately began directing traffic, and arranged the line and order for the women to enter the clinic. She was constantly on watch to see when the doctor was finished so she could tell the next woman in line that it was the her turn to go. Finally, after sending 11 women and their children before her, Manar came inside the clinic and sat and talked with us before seeing the doctor. Manar is originally from Yemen but fled the country with her six children when the situation in Yemen became increasingly violent and war broke out. She told us how important it is for her that her children get an education, but that in Yemen they were afraid to go to school because of the violence. She and her husband decided to move to Jordan, and after three years here, they are still adjusting to living life as refugees and learning to cope with war and the loss of their homeland. During our time with her, Manar was constantly making jokes, laughing, and telling us about her dreams to fly to Europe, and about how she wants to become a policewoman in the future. Although she came into the clinic with pain in her shoulder, she wore a bright smile the entire day, and was open to talking to us about her life. Dr. Rasha was able to provide her with anti-inflammatory medication for her shoulder, and Manar was grateful for the care. At the end of the morning, the women and their children got back on the bus and headed off back towards the center of the city, while Dr. Rasha and the team locked the clinic and packed everything up. As the sun rose higher in the sky, the yellow bus drove off and the team finished preparations to leave. GHNI’s Mobile Clinic provides cost-free care for refugee families to receive medical care in Jordan. The clinic has the ability to serve multiple populations from various backgrounds around the nation, and because of its transitive nature, it has the unique ability to move towards those who are in need. This gives GHNI a farther reach in serving those who are hidden and hurting in our midst. In November, we received a big shipment of blankets from a partner NGO. These blankets were distributed to many families in preparation for the cold months. In December, we were able to visit a lot of Iraqi families and donated goods and supplies to them, including blankets, food boxes, clothes, toys, and school supplies for the children. We were able to talk with them, get to hear their stories as well, and encourage them. 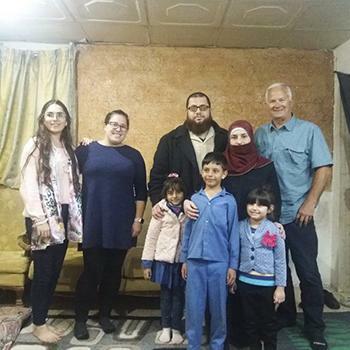 One home visit we did was with *Kamal, his wife, and their three children who are all originally from Baghdad, Iraq. Kamal was working as an electrician in Iraq, but he and his family came to Jordan in 2017, and since then he has not been able to work. He hopes that in the future he will be able to practice this trade again. Kamal and his family moved to Qaraqosh, Iraq after fleeing from Baghdad. In Baghdad, they suffered religious persecution and their lives were repeatedly threatened. They thought their move to Qaraqosh would allow them to finally reach a safe haven, but unfortunately this was not a reality. Eventually, a violent group moved into the area and destroyed the village. Kamal and his family were forced to flee to the North of Iraq, to Erbil, where they remained until October of 2017. They left Qaraqosh at 9:00 PM along with many others seeking refuge from the oppression of violence, but because of the crowdedness of the streets, what normally would have been an hour-long drive ended up taking the family six hours. Finally, at 3:00 AM, they arrived in Erbil. However, they did not know anyone in the area and had no place to stay, so they ended up sleeping in the streets that first night in Erbil. Fortunately, the company Kamal had worked for called him the next morning and told him they had a place for him to stay. They stayed in Erbil for a few months, and after the violence subsided in Qaraqosh, the family wanted to return home but found their apartment had been completely destroyed and the company Kamal had worked for had been sold. After discovering all of this, they decided to pack up their family and their lives, leave their homeland behind, and head for Jordan. The family now lives in a small apartment with little heating and few resources. They receive aid for rent, food, and supplies from GHNI and other local organizations. Right now, their biggest need is for two beds for their daughters. As the winter months creep in, it is becoming too cold for them to sleep on the ground. Kamal’s son wants to be an electrical engineer when he is older, just like his father. The family hopes they will be able to provide for themselves and are waiting to hear back from immigration offices. Kamal talks about his children with pride, but also notes how the war and the constant shootings and bombings have instilled fear in them. GHNI has been able to provide them with toys for the children, rent assistance, blankets, and various other things that they need. They were happy to meet and share coffee with us, and we were able to provide them with hope and encouragement for the future. GHNI staff as well as community volunteers and employees provided the supplies for the Assyrian Refugee Distribution event. Family by family, recipients’ needs were met in practical ways and in relational ways as well. The families who received supplies were forced out of their homes in Iraq due to war, violence, and persecution and are unable to work because of their refugee status in Jordan. Most of them are living in small apartments or houses, with little resources, little to no income, and awaiting news of approved immigration. Rami, of GHNI, was able to relay a hopeful message to the group of families. Some of them said it was the first time they had heard a message of love and were shown love at the same time. The response from families was heartening. They expressed their gratitude for the encouraging words and sense of community that they now felt. Through this event, families were encouraged and provided with tangible resources in order to meet their needs. This event was important both to the individual families as well as to the community, and we hope that the services provided to the refugees will continue to give them a glimmer of hope. In October, we held a Wheelchair Distribution event where we had people from different countries all over the world come and be fitted for wheelchairs according to availability. Many Syrian refugees received wheelchairs. The families were excited and very thankful to see their children receive the right type of wheelchair to meet their needs, as well as tips and advice on how to deal with certain matters and challenges. This collaboration between GHNI Jordan and a partner NGO has blessed so many families and individuals on many levels, not only the physical. We are happy that we're able to contribute in helping our community, and our Syrian guests, who are often overlooked and do not receive much help. The wheelchairs are of high quality, which expresses how valuable and respected they are to us, which speaks volumes to their wounded souls, as well as increases and soothes the quality of life for them. In December, *Masud is married with three children and the family was living peacefully in Daraa, Syria. Masud lost his sight when he was 16 years old. He now wears glasses, which helps him to see only light. His wife worked as a teacher for ten years in Syria. During a visit, we talked with the wife a little bit and she said they left Syria in 2014 when the circumstances started to get very bad. Since then, they have been here in Jordan. They haven’t applied for immigration to other countries as their two oldest children are now going to school. Masud’s oldest son wants to have a bright future and said he wants to be an ophthalmologist so he can heal his dad’s eyes. They were so happy with us visiting them. *For the purpose of safety and well-being, “Najam,” “Faiza,” “Manar,” “Kamal,” and “Masud” are pseudonyms for individuals being helped by this project.